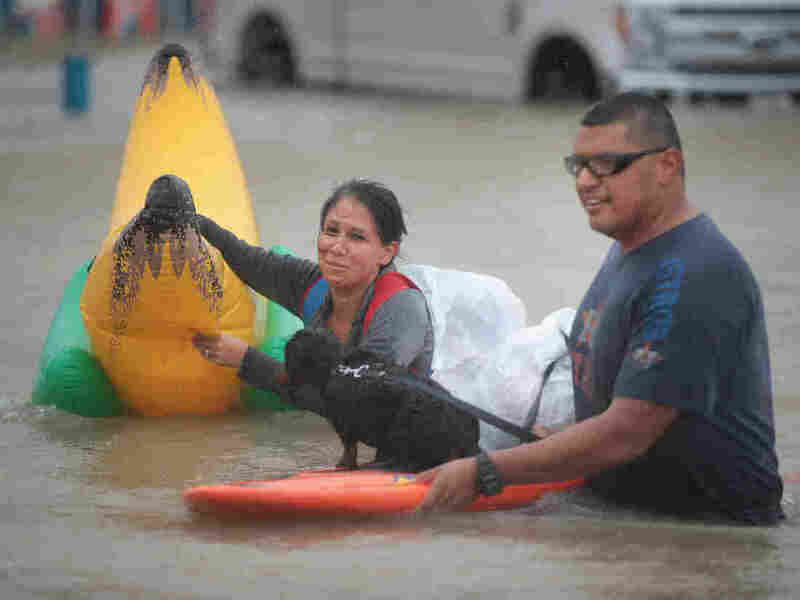 Houston Residents Turn To Social Media For Hurricane Harvey Relief : All Tech Considered Facebook and Twitter became de facto centers for thousands of stranded people as 911 centers became overwhelmed with calls. Police and officials are using social media as an essential tool to connect. People make their way out of a flooded neighborhood in Houston on Monday. Many people are turning to social media for help. Many of Tropical Storm Harvey's stranded flood victims haven't been able to get through to 911, compounding their fears. That's when Facebook, Twitter and Nextdoor stepped in. Annie Swinford is one of the many unofficial volunteers helping fellow Houstonians via the Facebook group Hurricane Harvey 2017 - Together We Will Make It. "When you see that somebody has posted that they're on their roof with their one-, three- and four-year-olds and the water's up to the roof line, you have to be willing to make that phone call for them," she says. They've become such effective tools to reach people that police and government officials are using these channels as an essential means of communication. Swinford found out how difficult it was to reach emergency personnel. She was put on hold for 45 minutes before talking to a live person during one 911 call, she says. Many people couldn't get through at all because the storm took out over a dozen emergency call centers. "This is a situation where technology and accepted norms of communication are outpacing government's ability to manage," says Rob Dudgeon, an emergency management consultant. He says most jurisdictions have surge plans, but there is only so much you can do to keep up with demand. "You can expect to have a lot of dropped calls, you can expect to have delays," he says. "Anything you design can only handle so much." Social media platforms from Reddit to Instagram have been flooded with requests for rescues. Nextdoor, the popular social media site for neighbors, says it has seen an unprecedented number of users in Houston in the last few days. "We're seeing people use our app if they can't get through to 911 and in addition to 911, in very emergency, life-threatening situations," says Steve Wymer, vice president of communications and policy for the site. In one post, someone wrote they were headed to the roof and put down their address, requesting an emergency rescue for themselves and their animals. Wymer says someone immediately responded: "Unloading my canoe now. I'm headed your way." It's not just stranded residents who are turning to sites like Nextdoor. The Houston Office of Emergency Management and the Harris County Sheriff's Office are using the site to post emergency information and communicate directly with residents. But at the same time, federal officials have warned people not to rely on social media for help. In a tweet, the US. Coast Guard asked people to call them instead. Consultant Rob Dudgeon says first responders simply don't have the bandwidth to monitor all the posts. "It is literally trying to drink from a firehose," he says. "It's very labor intensive to watch [social media] and because of the thousand different ways people can hashtag something or keyword something, trying to sort out what's relevant and what's not and what's actionable is very, very difficult." Of course tweets and photos can go viral and get attention almost instantaneously. Jeannette Sutton is an assistant professor at the University of Kentucky who studies social media. "I've seen some success stories online of people using social media to get the information to go viral and then people show up to airlift them out," she says. "For people who need assistance, it would be my recommendation to use all channels that you have," Sutton says. Which means charging your cell phone might be just as important as making sure you have food and water before a storm.